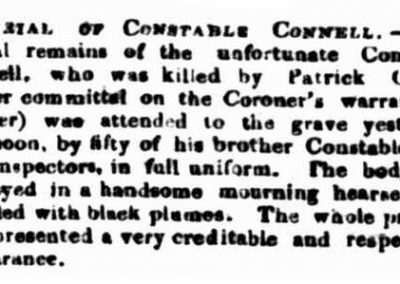 » CONNELL, John CONNELL, John | Cape Banks Family History Society Inc.
On the day of his death, the 23rd November 1841, Constable John CONNELL attended a street brawl outside the BEE HIVE Public House. 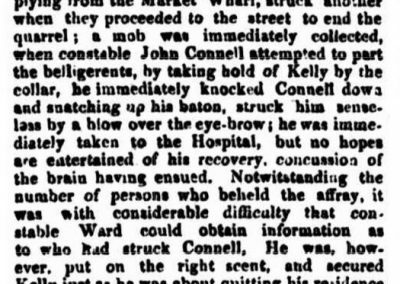 When the constable attempted to stop the brawling and apprehend by one of the main offenders he was set upon and his baton was grappled from his hands by Patrick O’NEILL, who then hit the constable in the face knocking him to the ground. Patrick O’NEILL had received his “Certificate of Freedom” in January of 1841(re Government Gazettes). He was taken to the hospital severely concussed and died a few hours later. 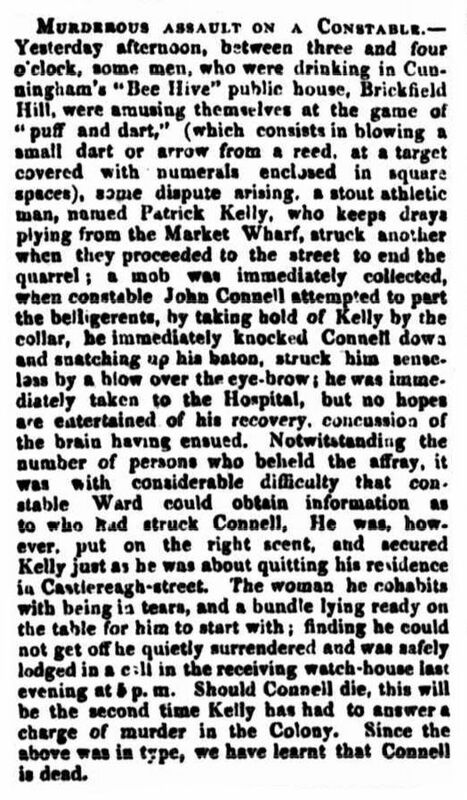 Patrick O’NEILL, who also used the aliases of NEALE and KELLY was arrested and charged with the “wilful murder of Constable John CONNELL”. 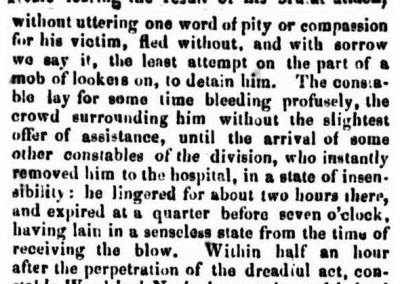 At his trial on 11th January 1842, the jury found Patrick O’NEILL “guilty, coupled with a recommendation to mercy” of the murder of John CONNELL and was sentenced to “death”, with every chance this would be reduced to a lesser punishment. 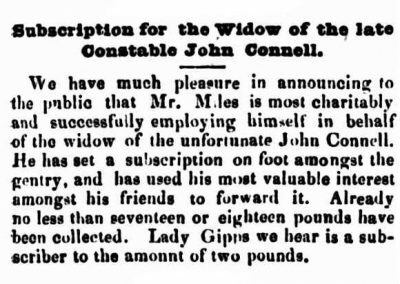 At the time of the trial the local community had contributed about ₤212 towards a relief fund for the widow of John CONNELL. Monuments relocated to Bunnerong by K.A. Johnson & M.R. 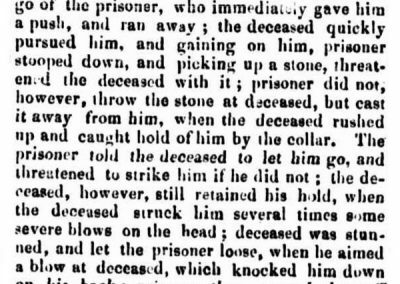 Sainty, page 68, number 1230. 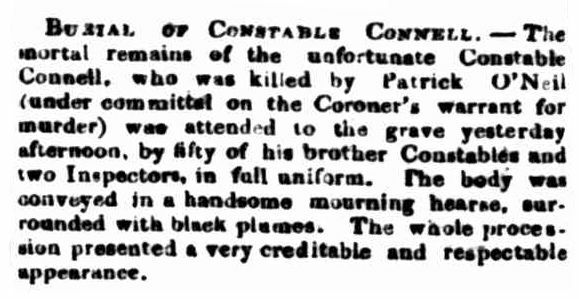 John CONNELL unfortunately killed on the 23rd November 1841 whilst in the execution of his duty as a constable in the Sydney Police, aged 21 years, also his infant son John Connell. 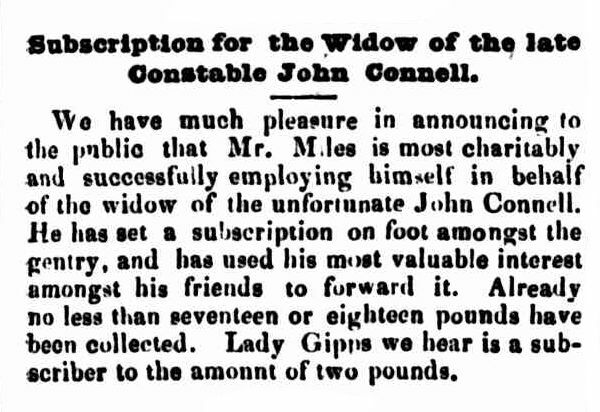 Erected by his wife.